Our expert engineers were on site within 24 hours. The initial work carried out on the required all the thermostats to be tested and calibrated to the correct working temperatures. 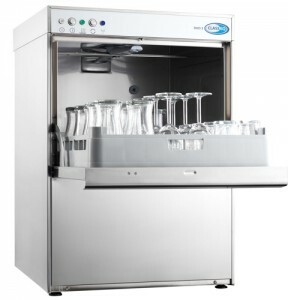 If the Glasses are exiting the Glass washer and not drying completely within a few minutes this is because the rinse boiler is not reaching or reached the correct temperature to allow the Glasses to steam dry. Bearing in mind that the Duo 3 leaves the factory, with a preset rinse boiler minimum start temperature of, 55 degrees celsius. This function prevents the glasswasher from starting a wash cycle, before reaching a safe washing temperature. But to get the best wash with a steam dry, you will need to wait for the Duo 3 to properly reach its optimum temperature. Which is indicated when the temperature lamp illuminates on the front panel, in between the power button and the cycle button. If you want to guarantee that your glasswasher will steam dry every time. The temperature pre-sets can be changed by one of our expert engineers to prevent the wash cycle starting before reaching the optimum temperature. The limescale was building up on the glasses because the water was bypassing the integral water softener and getting into the wash tank due to filling We were contacted by a sports bar for repair of a Classeq Duo3 Glasswasher, the glasses were exiting the glass washer without drying properly, also leaving behind a limescale film.problems, this problem was addressed and now only the softened water is entering the machine. Now the Classeq Duo3 is running smoothy fault free, with sparkly clean glasses!!! Enquiry Type: Faulty machine – Classeq Duo3. Response Time: Within 24 hours, with the machine up and running again. Time on Site: 2.5 Hours. Client feedback: Very happy with the service provided, and nice clean glasses.